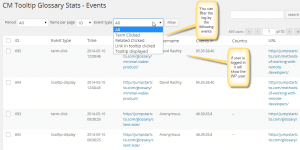 Track your WordPress tooltip statistics for better insights! The Glossary Logs & Statistics addon let’s you collect all the WordPress tooltip statistics required to analyze usage and make the most out of your glossary. It helps monitor user flow and better understand how your visitors are interacting with your CM Tooltip Glossary data. This WordPress tooltip statistics add-on also comes with an API that translates the user’s Geo-Location into a country name. And the best thing about it is that it works with every edition of the CM Toolip Glossary plugin, including the Free Version! Our WordPress Tooltip statistics addon is an important tool for content targeting and marketing, as well as for understanding how much your glossary is being used. 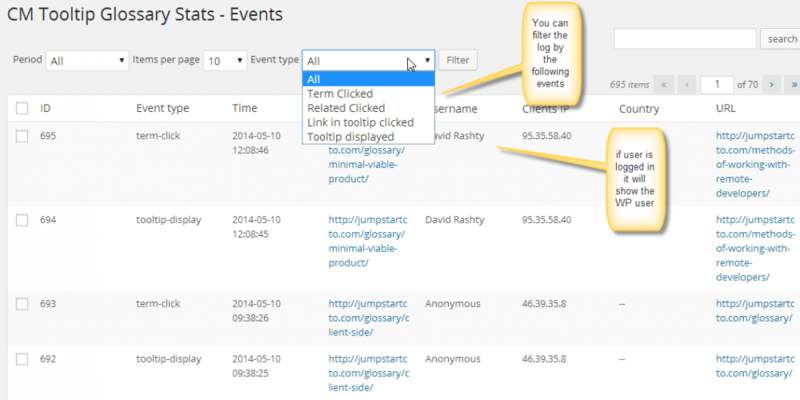 The following graphs show the ways that all the events which relate to the CM Tooltip are logged and sorted according to defined periods of time.